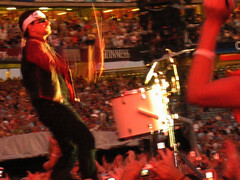 Fans either loved or hated it: Bono’s manic percussion act during Love and Peace or Else on the Vertigo tour. He always did march to the sound of his own drum. Bless. Whatever your feelings on the matter, you can now share your photographic memories of the Man with Big Drum and Bandanna at www.bonodrumming.com.